Size:According to customer feedback,our size is smaller than US size,so we suggest choose 1 size up.Please refer to size chart belowThe size will perfectly fit if you refer to this according to your measurement. XS(Label size L)---- Length: 28.5" ---- Shoulder: 17.5" ---- Chest: 42.5" ---- Sleeve: 24.2"
S(Label size XL) ---- Length:29.5" ---- Shoulder: 18.1" ---- Chest: 44.5" ---- Sleeve: 24.8"
M(Label size 2XL) ---- Length: 30.5" ---- Shoulder: 18.7" ---- Chest: 45.7" ---- Sleeve: 25.4"
L(Label size 3XL) ---- Length: 31.5" ---- Shoulder: 19.3" ----Chest: 47.2" ---- Sleeve: 26"
XL(Label size 4XL)---- Length: 32.5" ---- Shoulder: 19.9" ---- Chest: 48.8" ---- Sleeve: 26.6"
XXL(Label size 5XL)---- Length: 33.5" ---- Shoulder: 20.5" ---- Chest: 50.4" ---- Sleeve: 27.2"
NOTICE: This cotton jacket was originally made with durable cotton shell and lining. GUARANTEE:As a responsible seller, MAGE MALE provides guarantee for your every purchase from us. If you have any questions about our products, please contact us and it's our pleasure to be at your service. If this item cannot attract your eyeballs, click the blue "MAGE MALE" on the top, enter our store and find more surprises! Provide the best products and service for you and make you life better. 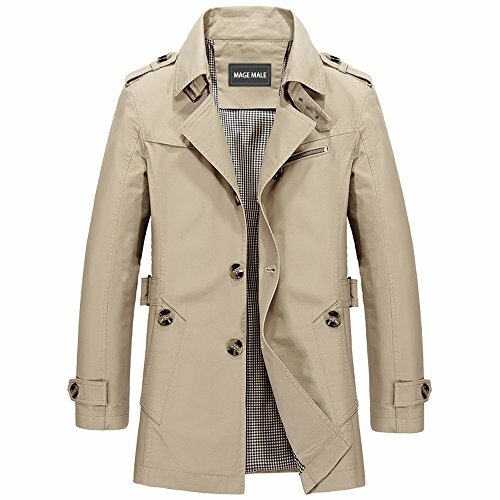 Single Breasted Classic Trench Coat for Men --- Casual and slim fit style, designed for daily life. You'll look handsome and stylish in this elegant coat. High-quality Cotton Fabric --- Lightweight thin fabric enhances breathability, wicks moisture away, gives you a comfortable feeling when wearing, perfect for spring and fall, great for professional attire,hiking, running, golf, mountain, camping, traveling and other outdoor activities. Size:According to our customer feedback,our size is smaller than US size,so we suggest choose 1 size up.Please refer to our size chart description carefully (Not the Amazon Size Chart). Machine washable, tumble dry.